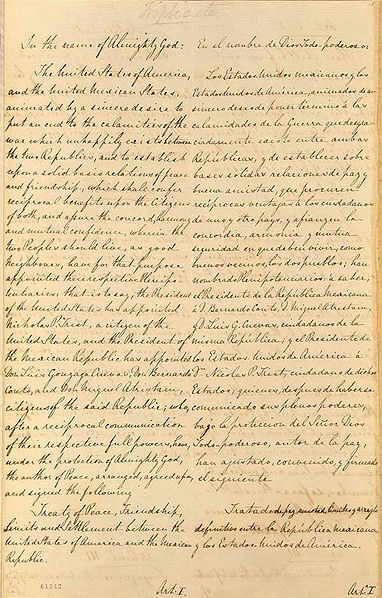 The Treaty of Guadalupe Hidalgo was signed in Mexico City on February 2, 1848, ending the Mexican War and extending the boundaries of the United States west to the Pacific Ocean. The terms of the agreement established the border between the U.S. and Mexico at the Rio Grande and the Gila River and granted the U.S. more than 525,000 square miles of former Mexican territory that includes present-day Arizona, California, western Colorado, Nevada, New Mexico, Texas, and Utah. This treaty, along with the 1853 Gadsden Purchase, completed the continental expansion of the United States. 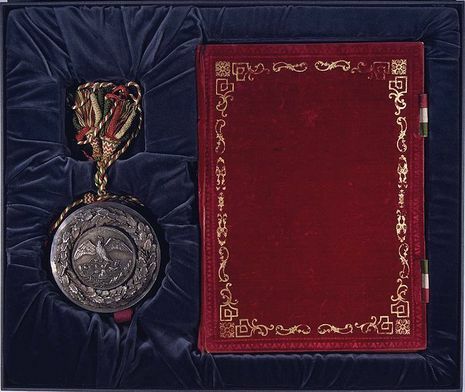 The Treaty of Guadalupe Hidalgo (Tratado de Guadalupe Hidalgo in Spanish) is the peace treaty, largely dictated by the United States to the interim government of a militarily occupied Mexico, that ended the Mexican-American War (1846–1848). The treaty provided for the Mexican Cession, in which Mexico ceded 1.36 million km² (525,000 square miles; 55% of its pre-war territory, not including Texas) to the United States in exchange for US$15 million (equivalent to $313 million in 2006 dollars) and the ensured safety of pre-existing property rights of Mexican citizens in the transferred territories. Despite assurances to the contrary, property rights of Mexican citizens were often not honored by the United States as per modifications to and interpretations of the treaty. The United States also agreed to take over $3.25 million ($68 million in 2006 dollars) in debts Mexico owed to American citizens.